Rhinegold ‘Elite’ Brooklyn Leather Country Boots. These country boots are made from waxy leather with a suede cuff and drawstring detail. They are designed to combine great style with performance. These boots also incorporate a subtle calf gusset to allow a more individual fit and improved comfort. Size 5, Lovely English leather riding boots, used but in good condition, zip back detail, 15inch calf. Comes with wooden trees. Condition is Used. Back zip in good working order. For sale Brogini long leather riding boots sz 5 slim calf. Bought for a gangly teenager but just too loose on the leg. Lovely boots in great condition as seen in pictures. Height including heel approx 18" (daughter is 5ft 5 and they fit great) calf at widest point about 13.5". 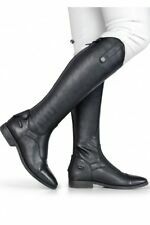 These are lovely Regent black leather high riding boots. These boots are a UK size 5. The photos show the soles which are barely marked. size 5 slim leg black leather riding boots made by Dublin excellent condition . Condition is Used. Collection in person only. Long leather brogini boots size 5. Dispatched with Royal Mail 2nd Class. Comes in original box, tried on but never used. This has been shown to reduce fatigue to the feet lower legs and back. They are stirrup friendly and have acid resist soles so useful for casual riding and wearing on the yard. Toggi Riding Boots Brown Size 5/38 . Condition is Used. Few small marks. HARRY HALL Black Leather Boots Size 5 worn once. Condition is Used. Dispatched with Royal Mail 2nd Class. Black size 5 riding boots by Mountain Horse, reasonable condition. Condition is Used. Dispatched with Royal Mail 2nd Class. Comes with inside boot holders to maintain boot shape. long leather riding boots. Condition is Used. Excellent condition. Height 41cm width 37cm. Tredstep Raphael Boots BNWT Uk 5 tall full calf. They come with boot trees, individual dust bags and Tredstep insoles. They are really lovely Boots with an RRP of £300 These are an unwanted gift as too long so I haven’t even tried them on. Unfortunately they’ve been sat in my wardrobe for a few months and the box is slightly damaged (see photos) but this hasn’t affected the boots themselves! Condition is New with tags. Dispatched with Royal Mail 2nd Class. Beautiful English leather riding boots X2 pairs size 5, excellent condition, calf 14.5in. Specially designed synthetic stretch outer calf. Available in sizes 38 (5) Calf (33cm) - 1 Height. Leather panel is durable and provides a natural grip. Genuine leather foot and inner panel. The HyLand Milan Long Leather Riding Boot is a traditional elegant field style riding boot with a full length zip and stretch leather panel for a smart stream lined fit. 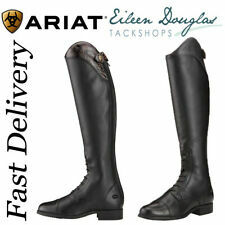 The Milan boot is ideal for a verity of equestrian disciplines. These luxury feel boots are made in soft feel leather giving the upmost comfort to the wearer. They feature a stitch detail on the toe cap for a more defined look. With a user friendly wider smooth feel zip pull and two pleated, elasticated leather sections at the back of the boot for a comfortable fit.